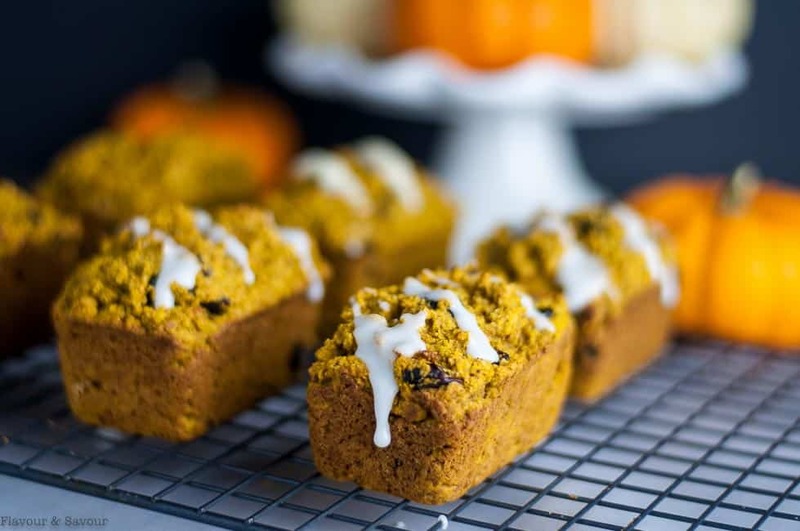 This tender moist Mini Gluten-Free Pumpkin Loaf is allergen-free! Made with oat flour, almond flour and applesauce, it’s dairy-free and is made without refined sugar. 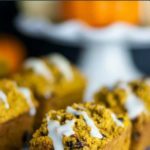 Mini gluten-free pumpkin loaf or pumpkin muffins: it’s your choice! This recipe works beautifully with either one. These mini loaves get their delicate sweetness from applesauce and a zero-calorie sweetener. I use Monkfruit Sweetener with Erythritol, but Swerve will also work well. If you are not avoiding sugar, you can use the same amount of regular granulated sugar or coconut sugar. As soon as the leaves start changing colour, I start thinking of apple cider, cozy crock pot meals, and making wholesome loaves and muffins. There’s something about cooler weather that makes me want to “nest” and spend time in the kitchen baking. I love the way my kitchen smells at this time of year! Cinnamon, cloves, nutmeg . . . all those pumpkin spice aromas wafting through the house makes letting go of summer and welcoming fall that much easier. 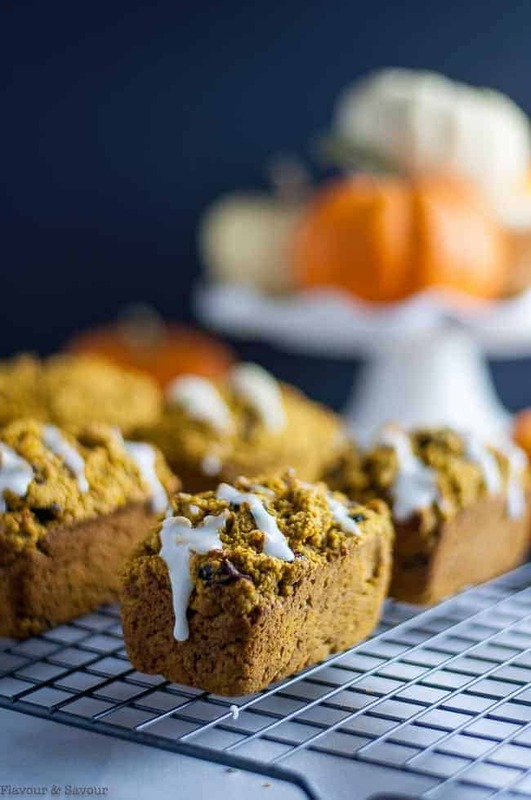 This recipe for gluten-free mini pumpkin loaf uses homemade applesauce to add nutrition, moisture and natural sweetness. I simmer it in my slow cooker and freeze it in small glass Mason jars so I always have some ready for a recipe. Homemade applesauce is so easy to make. Simply slice some apples (peel them, if you like), add a splash of lemon juice, half a cup of water and a cinnamon stick or a teaspoon or two of ground cinnamon and let it cook on the stove top or in a slow cooker until the apples are tender. Then mash or purée it with a stick blender and transfer to jars to refrigerate or freeze. 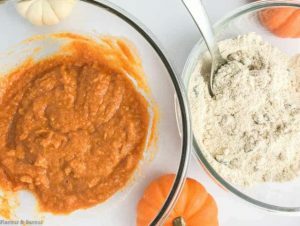 Mix the wet ingredients in one bowl, the dry ingredients in another, then combine the two. To add even more flavour and interest, stir in half a cup of one of the following to the dry ingredients before combining. This will prevent them from sinking to the bottom of the baked goods. Scoop into a baking pan of your choice. I used an 8-cavity non-stick mini loaf pan. Alternatively, you can use a regular muffin pan. This recipe yields 6 large mini loaves (that sounds like a contradiction!) or 8 good-sized muffins. Hint #1: Since gluten-free baked goods don’t usually rise like those made with wheat flour, I make them look like they have risen! 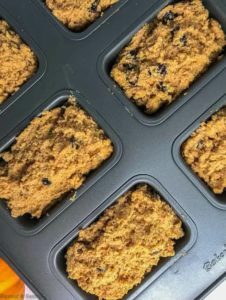 Use a large cookie scoop to half-fill 6 cavities of the mini loaf pan, smoothing to the edges, then add another half scoop and create a mounded top. If using a muffin pan, fill 8 cups, creating rounded tops. Hint #2: To make muffins and loaves even more appealing, I press a few of the add-ins (like chocolate chips) into the top of the unbaked muffins or loaves just before putting them in the oven. Muffins or mini loaves will keep in an airtight container lined with paper towel (underneath and on top) for 4 days. To freeze, wrap individually and store in an airtight container or in a ziplock bag. Just because you’re avoiding gluten or dairy or sugar doesn’t mean you can’t enjoy your favourite baked goods. 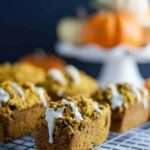 Celebrate the cozy days of fall and make a batch of these loaves or muffins for someone you love! 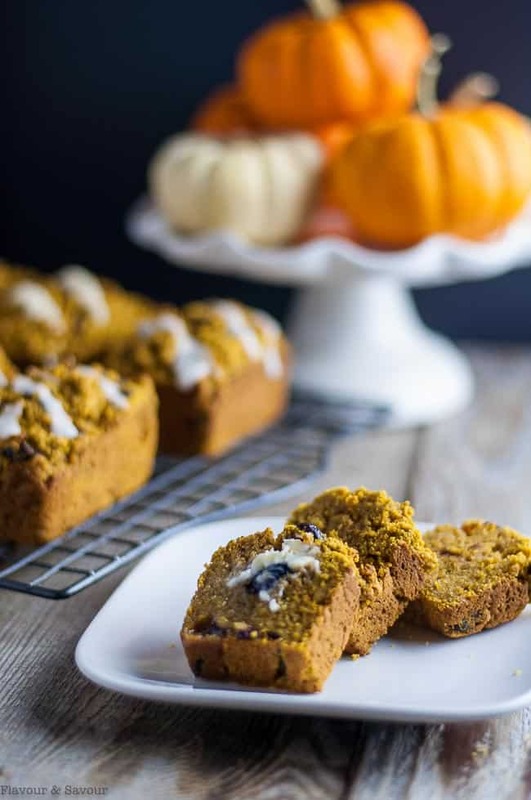 This tender moist Mini Gluten-Free Pumpkin Loaf is allergen-free! Made with oat flour, almond flour and applesauce, it's dairy-free and is made without refined sugar. Bake it as loaves or muffins! Preheat oven to 350°F. Very lightly grease an 8-cavity non-stick mini loaf pan or line a 12-cup muffin pan with culinary paper liners. In a large bowl, combine pumpkin, coconut oil, sweetener, applesauce, egg and vanilla. In a medium bowl, whisk together the oat flour, almond flour, baking powder, baking soda, spices and salt. Add to the wet ingredients and stir until all flour is incorporated. Scoop into 6 cavities of the mini loaf pan, smoothing to fill the cavities half full, then add another half scoop and create a mounded top. If using a muffin pan, fill 8 cups, creating rounded tops. Bake for 18 - 24 minutes, or until a toothpick inserted comes out clean. Cool on a rack for 15 minutes, then carefully remove from pan or carefully remove paper liners if making muffins. When completely cook, store in an airtight container for 4-5 days or in freezer for a month. I love the idea of making mini loaves, which would be perfect for a party. I love these little mini loaves! It is a great way to get more veggies in your diet by enjoying these. Yummo! These are adorable and they look delicious! I love that you made them gluten free! 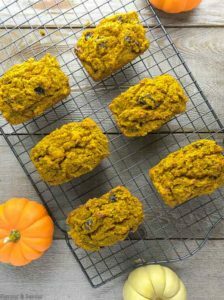 These really do look like the perfect Autumnal treat! 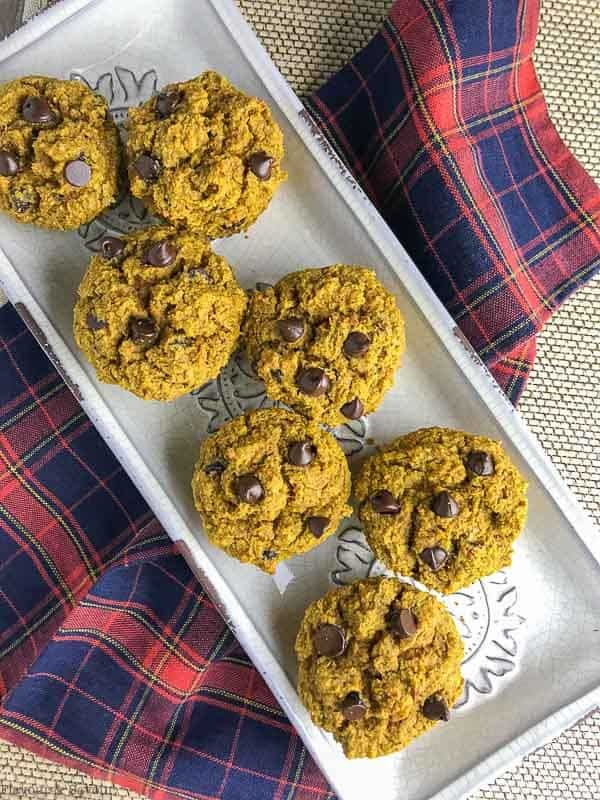 My kids would really enjoy these – and as they are gluten free, my husband would be able to enjoy them too! These are so cute and perfect for autumn!